The Ohio State University Human Research Protection Program (HRPP) adheres to the ethical principles for the protection of research participants summarized in the Belmont Report and complies with federal regulations, guidance, and state laws related to human subjects protection. For federally sponsored research the university maintains a Federalwide Assurance of Compliance (FWA) with the Office for Human Research Protections (OHRP). 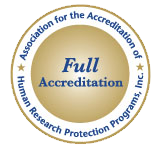 The Ohio State University is accredited by the Association for the Accreditation of Human Research Protection Programs, Inc. (AAHRPP). The ethical and regulatory requirements of the HRPP apply to all research involving human subjects conducted on behalf of The Ohio State University (regardless of funding) and to all individuals and components of the program. Research is subject to the HRPP when it includes activities that are research involving human subjects as defined by either DHHS or FDA regulations. Ohio State becomes “engaged” in human subjects research, and therefore bears responsibility for protecting participants involved in the research, when its employees or agents intervene or interact with living individuals or obtain individually identifiable private information for research purposes. The university is also engaged in human subjects research whenever it receives a direct DHHS award to support the research. For more information, see Human Research Protection Program. An Institutional Review Board (IRB) is a committee, including volunteers from Ohio State and its surrounding community, whose primary responsibility is to protect the rights and welfare of human research subjects. The authority conveyed to the IRBs includes decisions to approve, disapprove, require modifications, monitor, suspend and terminate research projects involving human subjects. There are three internal IRBs at Ohio State that review, approve, and conduct periodic reviews of research involving human subjects (including data and biological materials obtained from human subjects) to ensure risks have been minimized and the potential for benefit has been maximized for human subjects participating in the research. For more information, see IRB Composition and IRB Member Roles and Responsibilities. Reviews research in the social and behavioral sciences. Reviews research in the health and biological sciences. All research activities involving human subjects must be reviewed and approved by an IRB unless the Office of Responsible Research Practices (ORRP) can prospectively determine that the research falls into a category of exemption established by federal regulation. On behalf of the HRPP, determinations about whether an activity is exempt or constitutes research involving human subjects are made by designated ORRP staff with no direct involvement in the proposed activity. See Exempt Research for more information. The IRB Policy Committee is authorized by the Vice President for Research and appointed by the Senior Associate Vice President for Research to receive input from the university community, develop HRPP policies, and support HRPP educational, quality improvement, and outreach activities. The IPC is made up of the IRB Chairs and Vice-Chairs, at-large faculty members representing the investigator community, and the ORRP Director. Discusses policies, procedures, and addresses issues in human subjects protection. The Privacy Board reviews requests for waiver of HIPAA authorization in human subjects research involving protected health information (PHI) that has been determined to be exempt. For human subjects research that involves PHI requiring IRB review, the IRBs act as the Privacy Boards for requests for waiver of HIPAA authorization. Reviews research involving PHI when the study is determined to be exempt from IRB review or when an external IRB serves as the IRB of record but does not serve as the privacy board. Investigators may not solicit subject participation or begin data collection until they have received approval from the appropriate IRB or notification that the research has been determined to be exempt. To approve research, the IRBs must determine that the regulatory criteria for approval are met, as described by HRPP policy, Review of Research by the Convened IRB. Initial reviews must be conducted by the IRBs at convened meetings, except where expedited review procedures are permitted. For more information about the categories of research that may undergo expedited review, see Expedited Review Procedures. To ensure an effective review by the IRB, a full description of the planned research (i.e., a research protocol or proposal) must be submitted at the time of initial review. A research protocol provides information such as the study objectives, background, detailed plan for conducting the research, and discussion of how the research findings will be analyzed. See Guidelines for Writing a Research Protocol. For most research, informed consent must be obtained and documented using a written document that provides key information regarding the research (unless waiver is appropriate). Consent templates containing the basic elements of informed consent and instructions for their use can be found at Consent, Assent, and Parental Permission. Proposed changes in research activities (amendments), including changes to the protocol or informed consent process, must be reviewed and approved by the IRB before implemented, except as necessary to eliminate apparent immediate hazards to subjects. Minor changes that pose no more than minimal risk to subjects can be reviewed by expedited procedures. Amendments involving more than minor changes will be reviewed by the IRBs at convened meetings. Investigators may not implement research changes until final IRB approval is received. Research must undergo continuing IRB review at intervals appropriate to the degree of risk, but not less than once per year. IRB review must be performed at a convened IRB meeting unless the research meets the criteria for expedited review. At the time of both initial and continuing review, the IRB must ensure that the criteria to approve research are satisfied, including determinations regarding risks, potential benefits, informed consent, and safeguards for participants. At continuing review, the IRB must review research progress and any new information pertinent to the Board’s decision to re-approve the research. IRB approval must be obtained before the end of the current approval period to avoid lapse. If approval expires, the research must stop unless the IRB finds that it is in the best interests of individual subjects to continue participating in the research. Enrollment of new subjects cannot occur after the expiration of IRB approval. Reminders are sent to assist researchers in meeting continuing review requirements. Protocol expiration dates can also be checked in the Study Team Lookup tool. Under certain conditions, the requirements for continuing IRB review can be satisfied by completing a brief annual status report. The abbreviated annual status report is limited to questions regarding study changes over the previous year and current study status. The types of studies eligible for submission of an annual status report are described in HRPP policy Expedited Review Procedures. An overview of how submission are routed for annual review is available here. Principal investigators are responsible for notifying the IRB when a study is completed or is being closed. It is important to note that all research activities involving human subjects, including data analysis with individually identifiable or coded private information, must be complete in order to terminate IRB approval for a study. A final study report may be completed at any time during the review period. Ohio State holds Federalwide Assurance (FWA) #00006378 from the Office for Human Research Protections in the Department of Health and Human Services. This FWA is an agreement between DHHS and Ohio State to review and approve federally-sponsored research involving human subjects in accordance with the ethical principles outlined in the Belmont Report and the DHHS regulations 45 CFR Part 46. For more information, and for a copy of Ohio State’s assurance, see Ohio State Federalwide Assurance. Staff in the Office of Responsible Research Practices support the human subject research committees. Most ORRP staff members are Certified IRB Professionals, and all are available to help researchers navigate the IRB and exempt submission procedures. Please consult the ORRP website for staff contact information.